jVSTwRapper is an easy and reliable wrapper to write audio plug-ins in Java. It enables you to develop VST (2.4), Audio Unit (AU) and LADSPA compatible audio plugins and virtual instruments plus user interfaces (Swing) and run them on Windows, Linux and Mac OS X. Five demo plugins (+src) are included. The Steinberg VST interface technology is used and supported by a large variety of different audio applications on different platforms like Windows, Linux and Mac OS X. This technology is a de facto standard for audio applications, and provides the richest set of functionality for audio plugin programming. jVSTwRapper therefore uses VST as the base technology and translates other audio plugin standards such as Audio Unit (AU) or LADSPA to VST by means of "native stubs". 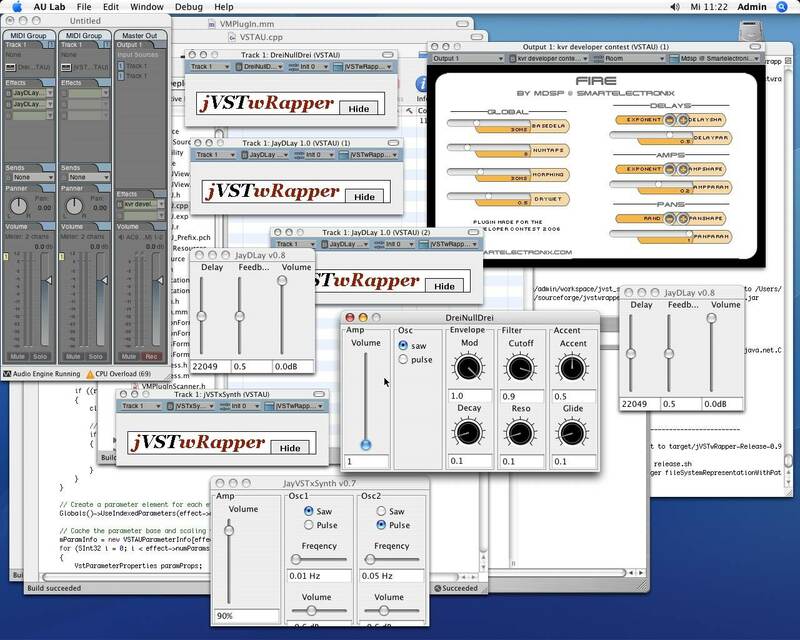 jVSTwRapper therefore is a multi-platform, multi-plugin-technology project, grounded by VST technology. By providing native stubs for each platform and plug-in technology, a single jVSTwRapper plugin runs on three platforms (Windows, Linux and Mac OS X) and supports three plugin technologies (VST, AU, LADSPA) without any code changes or recompilation. Multi-platform plugins are created with a single command.